After a winter playing several instruments and editing I'm very pleased to present the 'Hector Lake Ramble' with your pal RIDGEWALKERPETE..This hike was a 6 day trip in great weather that goes beyond the end of the trail. What a treat to have dry boots and even rest in the shade after baking in the mid-day sun beside a numbingly cold lake. One morning I noticed a dragonfly that would go back and forth along the shore returning to my spot about every 5 minutes . I set up the camera and waited patiently for the return which you may notice in the video. The route up the prickly gully was a bad call but I figured it out on the way down. The animals always have trails to get from one valley to another or up to the high lakes and windy ridges. After a long wait a deer finally passed by where I could film it.I didn't have my gloves and as soon as I held up the camera the mosquitoes and black-flies commenced the feast on my hands. During 2007 there were some big wind storms here leaving many of the trails with huge trees blown over.That really slows things down as you climb way up and over or crawl with your pack through the mud and branches.I bring some flagging tape and always fix stretches that are confusing for those who follow and frankly so I don't get lost on the way down.A bad turn can gobble up several hours of valuable time and energy.
. One evening I saw a black bear near my camp but it stayed away. During meal time I am always on guard because I know how quietly bears and cougars can move around.A few years ago during an 8 day hike I was having breakfast ,doing my 'stand up and look around' bit every couple of minutes, when I noticed a bear about 4 meters away in the bushes that looked like a shadow silently creeping closer for a snack . I was starting to dump the porridge on the ground when I stopped and realized that first of all I had several days to go and the bear may just want more. I quickly packed up the food and headed down the trail remembering to beware if it is following me and may be a predatory bear. I got to a high spot without rushing and saw it following off to the side.I had some bear spray ready and was prepared to stand tall with a rock to try and frighten it off [Think of it as a really important acting audition.]. I walked further along the trail and was greatly relieved when it stayed behind but then I came upon another bear which seemed to be feeding contently . I looked again at my map and noticed the trail crew had named this stretch '3 bears camp' .After years of animal encounters I have learned that they will avoid conflict but defend themselves if frightened. Note to self: NEVER FRIGHTEN WILD ANIMALS....especially the big ones! During the winter I was editing a couple of other hike videos and recording the music tracks. That was starting to bog down so I brought in a couple of great friends[ BILLY JAY PETERS BAND ] to record something different.Mickey Hovan nails down the those excellent bass parts while I'm on the drums and Jay Macdonald does his improvised jazz wild thing on the keyboard.After some editing I added guitar and synthe.The hiking takes such a small part of the project while the music requires a great journey. 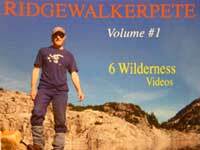 You have great adventures Ridgewalker. Just keep your distance from the four-legged critters.